Thank you all for your support in the 2018 Mid-Year Appeal. We look forward to sharing the 2019 Mid-Year Appeal with you next year. In our daily lives, we sometimes take our independence for granted. Celebrating the anniversary of our nation’s Independence Day reminds us of how important freedom and independence are for each of us. At DSC our mission is a daily reminder of the importance and value of independence as we support individuals with intellectual and developmental disabilities to reach their personal and employment goals and dreams. DSC serves approximately 1,100 children and adults in our community, providing each person with individualized services and supports tailored to their unique needs. With these personalized services and supports, people are able to achieve independence…just like John. John has been receiving services at DSC since 2000. Since that time, he had been working at one of DSC’s internal worksites. John was very happy with his job but staff at DSC knew he could be successful working in the community and offered him an opportunity to participate in the DSC Job Club. Job Club is a 12-week program that focuses on successful employment habits including interviewing, positive interactions with work peers, boundaries, and other skills that allow for success at work. 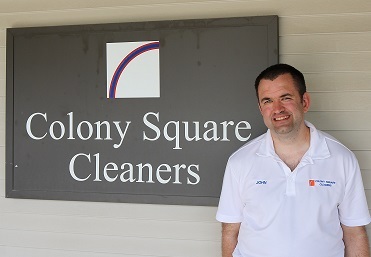 Through this process, John expressed his interest in cleaning, so after completing Job Club, a job match was made for a position at Colony Square Cleaners, where he has been working five days a week since January. Terrance Jones, John’s manager at Colony Square shared that, “John is a big help with the cleanliness of our facility and our business contracts. We look forward to him coming to work every day. He has a great sense of humor, keeps us laughing, and is dependable.” John shares that he “likes the work” and he has enjoyed meeting new friends. He also admits that he likes the money so he can spend it the way he wants! There are many people, living in our community, who are eager to have the opportunity to receive the types of services and supports John is enjoying. As we continue our efforts, we ask for your financial support to help us offer independence for all who receive, and are in need of, DSC services. By making your gift today, you partner with us to promote independence and celebrate its true meaning! P.S. Please make your donation today and help create greater independence for people in our local community!